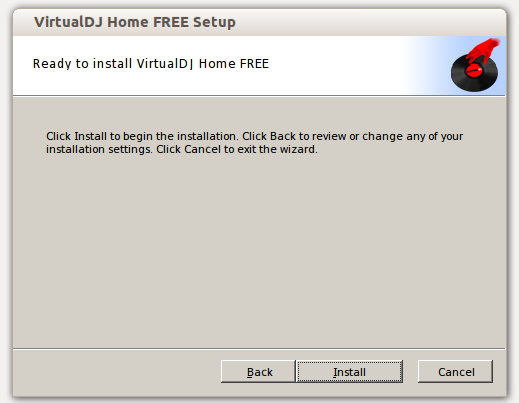 How to Install 'Virtual DJ' (7.4.1) on Ubuntu 13.10 ? 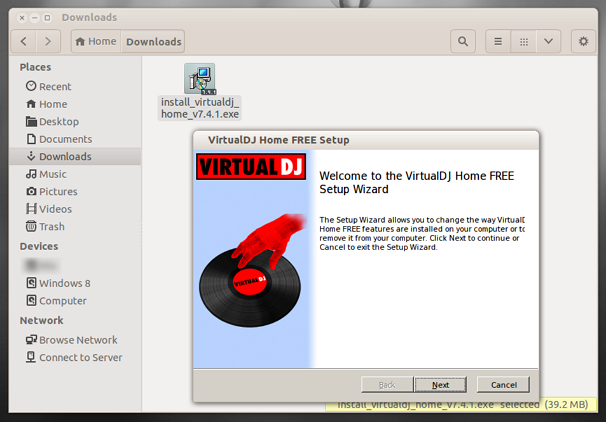 How to Install ‘Virtual DJ’ (7.4.1) on Ubuntu 13.10 ? ‘Virtual DJ’ is also one of the leading MS Windows based music mixing software and many DJ hardware devices (such as those from ‘Pioneer’) include built-in support for ‘Virtual DJ’. 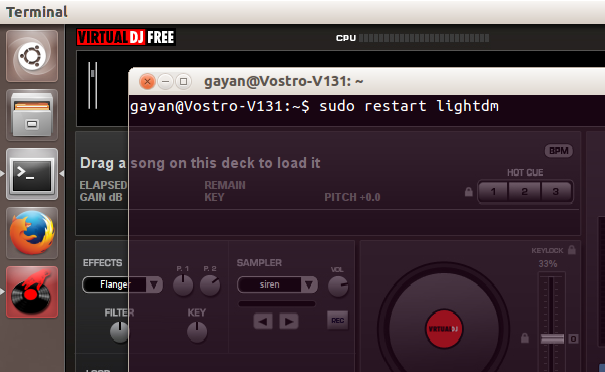 But as a GNU/Linux user, the problem with ‘Virtual DJ’ is that it runs on Windows and Mac OS X only. So I decided to see if it could be run on Ubuntu 13.10 using ‘Wine’ (a tool that lets you run some of MS Windows software on GNU/Linux), and as you can see from the below screenshot, despite few small issues, I was quite successful in doing so. I decided to write a simple ‘how to’ guide hoping that someone else might also find it useful. So, without any further delays, let us begin the ‘process’ 🙂 . It is quite simple. First we need to install ‘Wine’ on Ubuntu (I am running 13.10 but the same instructions should work on other versions as well) & then we will install ‘Virtual DJ’ for Windows setup using it &, … that is it!. Open up the Terminal emulator and enter the below commands. 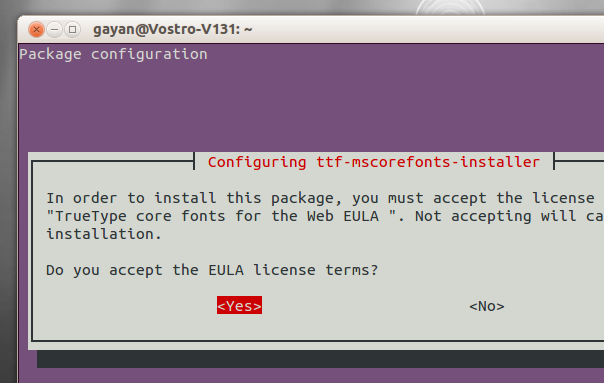 If you want the latest stable release of ‘Wine’ which is currently 1.6, then enter the below command. If you want the latest unstable builds (which I do not recommend), then enter the below one instead. On a newly installed Ubuntu machine, ‘Wine’ needs to download around 240-250MB of data, so it might take a little while to download. 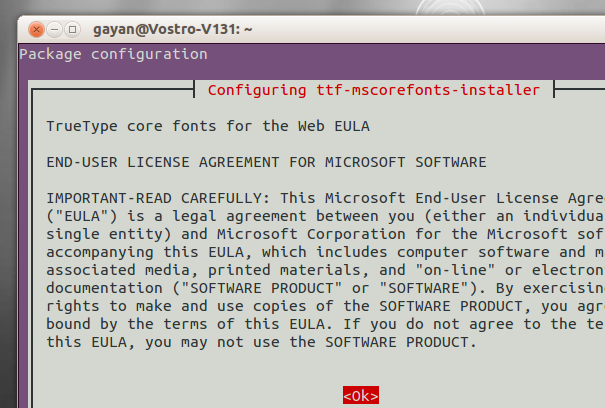 While installing a downloaded package (Microsoft’s proprietary fonts), you will have to ‘agree’ its EULA terms, & you can use the ‘Tab’ key and the ‘Arrow keys’ on your keyboard for selecting the correct buttons (shown below). The rest is pretty much automatic. Download ‘Virtual DJ’ 7.4.1 for Windows from this page. Once it finishes downloading, go to the downloaded location and double click on the ‘Virtual DJ’ setup file. Before executing the installer, ‘Wine’ will configure its settings first (only happens when you open it for the first time). Then it will open-up the installer, just like on Windows. One thing to note is that, when you come to choosing installation method and you if chose ‘Typical’, then wait for few seconds for the ‘Install’ step to appear (shown below). When all is done, click on the ‘Finish’ button and now you should see a ‘Virtual DJ Home Free’ shortcut icon on your Ubuntu desktop. This is pretty much it, now you should be able to run it by simply double clicking on it. As mentioned in the beginning, I am not a DJ and thus, I can not go into heavy details. But, except for few minor issues, pretty much all the other features that ‘Virtual DJ’ present you with on Windows, worked on Ubuntu also! (including ‘Sound Setup’, Skins, effects, audio recording etc). The only major issue is related to Window management. If you try to maximize ‘Virtual DJ’ and then unmaximize it (also happens if you try to minimize it) then the whole desktop gets stuck. The only fix is to open Terminal emulator (by pressing ‘Ctrl’ + ‘Shift’ + ‘T’ keys) and restart the display manager by using the below command. Although the desktop can be recovered through it, you will lose all the opened application windows and their data. If you however can avoid using the ‘Minimize’ & ‘Maximize’ buttons, you should be fine. 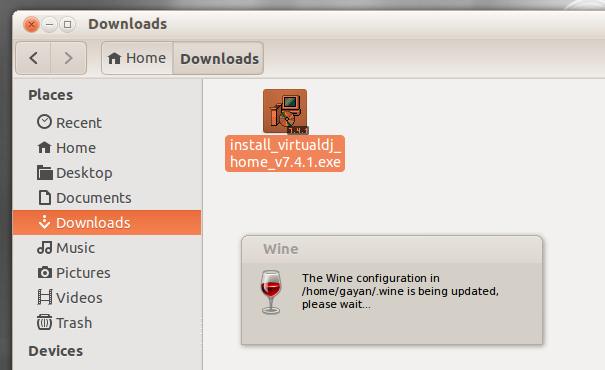 You can somewhat fix this by using ‘Winetricks’ utility that comes with ‘Wine’. After opening it (shown above), choose: ‘Select the default wineprefix‘ -> ‘OK‘ -> ‘Change Settings‘ -> ‘OK‘ -> ‘windowmanagermanaged=no Prevent window manager from controlling windows‘ -> ‘OK. Now close the ‘Winetricks’ window (two windows that pop-up, one after the other). After this, whenever you minimize ‘Virtual DJ’ it will be located around the bottom left-corner of the ‘Application Launcher’ (on ‘Trash’ but you can move the icon) and you can restore it by clicking on its icon. This does not solve it completely as the desktop gets stuck if you click on the ‘Maximize’ button, but you can recover it by: 1. unmaximize ‘Virtual DJ’, 2. minimizing it, 3. then bringing it to front again (it is weird, but it works). The CPU usage indicator in ‘Virtual DJ’ does not work in Ubuntu. You might also notice a slight delay with loops in ‘Virtual DJ’. I was able to completely get rid of that by removing PulseAudio and using ALSA. If you notice it also, then you can try that. 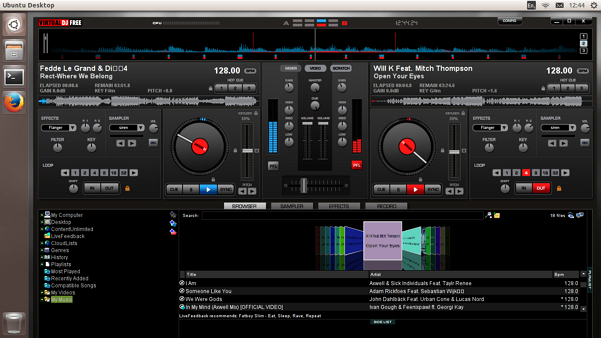 So, other than these few issues, I was able to run ‘Virtual DJ’ 7.4.1 on Ubuntu 13.10, quite successfully. Good luck. Your friend can install Mixxx from Ubuntustudio or any other flavour of Ubuntu. Ubuntustudio is best for audio becuase its already optimized. This is assuming that your friend wants to play loud or practise loud. The big thing about installing Virtual DJ is that through Wine your adding a layer of intetpretation versus having a program use the sound system as directly as possible. Secondly with something like Jack rack, your friend will go insane with all the sound control such as compressors, limiters and so on. Another one to install would be calf plugins which are excellent and free like everything else I have mentioned. I too was a DJ, in clubs, on radio, and heard for a while internationally. I have been using Linux for quite some time and suffered through the back and forth to windows, installing this driver and that and eventually poluting the system. Your friend will find a very intuitiative interface with Mixxx and also one he can use on just about any machine. I believe it can even be made portable with a key drive and ubuntustudio on it. Haven’t tried that yet. The thing that impresses me most is Harrison, the recording studio console maker, is behind Linux with Mixbus, which is like Protools or Adobe Audition. Its not free, but can be had for around $149, which is thousands less than a protools set up. If your friend cuts beats, or masters some tracks, Mixbus or Ardour (free) would be a great tool to fit in with that. I am recomending pure Linux when ever possible for one main reason. You can stop the upgrade cycle where you shell out more money to find out if the improvements are worth it. If your friend is playing in the high level club circuit, remixing for artists, and so on. He will need to be sure his tools are legit. Linux is so much like Mac OSx because OSx is based on it. Protools seems to like that envoirnment as do artist that feed off it. To me, Linux is a new breed to feed the creative. Virtual DJ cost me quite a bit and forced upgrades. It isn’t the shizzle in my dizzle. But to each their own. First of all thank you for the informative comment, I appreciate it. I have a newbie question about Mixxx though. I have tried it in the past, but the ‘sync’ button was never able to correctly sync tracks. Is there a plugin one has to install manually, or am I missing something ? Thanks. Yes it’s called learning how to beatmix with your ears rather then a button. Might you suggest a different subreddit I should have posted this in?